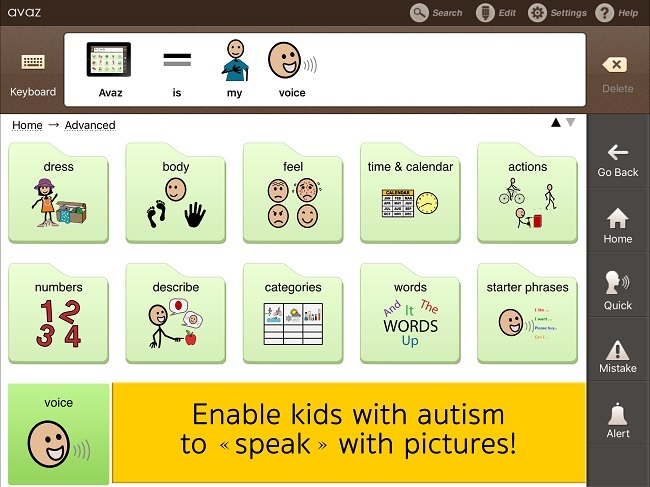 Avaz is an alternative/augmentative Communication (AAC) app that helps children with autism communicate through pictures. For children with Autism Spectrum Disorder (ASD), communication is a challenge. They find it hard to understand and use spoken language. Various studies show that children with autism find it a lot easier to communicate with visual and auditory aid. When Ajit Narayanan returned to India leaving his Silicon Valley job and was looking to start something with innovation at the core he started the Invention labs in 2007. Around this time Vidya Sagar Centre for Special Needs reached out to him and discussed the possibility of developing communication tools for kids with autism. Ajit Narayan now knew what he needed to start. He worked with Vidya Sagar and created a communication tool called ‘Avaz’. Avaz is a picture-based communication tool, which kids can use to communicate. “Kids with autism don’t understand text. They prefer pictures, which are a great way for them to communicate. We have designed it in a way that not only children, but a teacher or a speech therapist can also use it to teach language and help children with nouns, verbs, and help them begin building language,” says Narayanan Ramakrishnan, Avaz product lead at Invention Labs. 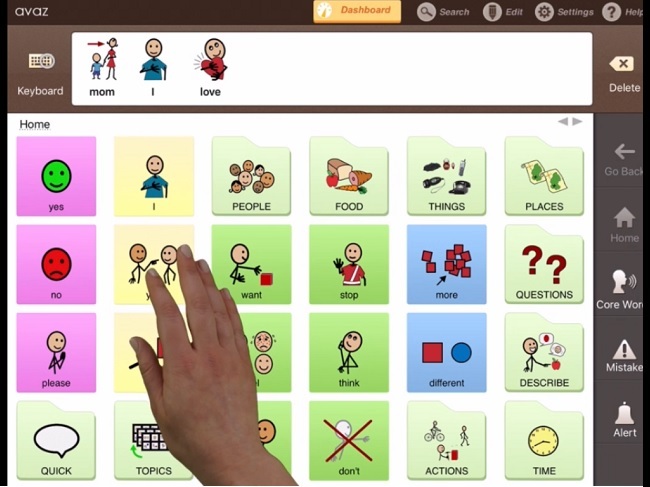 Avaz is an Alternative/Augmentative Communication (AAC) app that has a set of pictures to express words like ‘I’, ‘want’, ‘need’ and build sentences to express themselves. There is a wide range of words, which help children communicate anything, right from wanting to eat, to say they don’t want something to even learn spellings and how sentences are formed. Ramakrishnan says people even take exams with Avaz. It serves as an artificial voice for them. “In communication, what’s important is you need access to phrases that are functional like I want to go to the toilet. Initially, the teacher trains them and then they can use it independently,” Ramakrishnan says. Invention labs initially started with making its own tablets integrated with Avaz but realising that it is not a very cost efficient, it moved to concentrate on developing an app. “Avaz is part of their communication, but there might be more apps useful for kids which Avaz might not cover, like mathematics, so they can download those as well on that device. They won’t be restricted to just our app,” Ramakrishnan says. There is also an add-on app called FreeSpeech, which lets children understand and form more complex sentences. For a child with Autism, when there is a sentence like ‘I want to go to play’, you might start with training them with saying I want to play. But often, they get confused with what a word like ‘to’ is doing there. Ramakrishnan says that they built a grammar engine where you give it the main words and the app puts it together in a sentence. It helps you develop sentences by asking what, why, when type of questions. There is an algorithm that figures out how to create a grammatically correct sentence. This is something that schools can use as language development tools and help children intuitively string together complex sentences. Recognising that India has very few speech therapists and that AAC devices are slowly catching up, the company has also built a training module to help speech therapists and parents of children with autism. The idea is to educate parents on small things they can do to improve their child’s communication. Avaz is a paid Android and iOS app that is available across the globe. In India, the app costs about $100-110. In the US, the app is available for $200. There is also a free app which people can try and then go for the paid version. “When we launched in India, we also put it on app store and got many downloads from the US. It was well accepted and we also got some partnerships in Denmark. Avaz is probably the number one app in Denmark in this space and in top 3-4 in the US,” Ramakrishnan adds. Ramakrishnan says that the US has a more structured system in schools where kids who need communication intervention go through a process of evaluation and then they get funded through insurance or by the government. That's how Avaz took off in the US. We have sold the app to the school districts like the Chicago public school district and New York school district who have used it with their kids. So far, the app has seen 50,000 downloads worldwide. The Tamil Nadu government too has bought 200 devices with Avaz app and will distribute it in all districts in the state. It is also talking to other state governments to implement this model. Apart from up front app downloads, Avaz is also sold to schools, where they help them with the installation and train teachers to use the app. Currently, Invention Labs is also working on a Hindi version of the app with a working prototype. It is also running some experiments in Chinese, Spanish and eventually wants to add in a range of languages. It is also working on being able to develop language tools that can use local language that the child understands to learn more languages. “If a child is able to use, say, Tamil to learn English, that would be pretty powerful,” Ramakrishnan says.